Steve Evans will advise Leeds United to sell Sam Byram in the January transfer window if the defender refuses to rethink his decision to turn down a new contract at Elland Road. Byram, 22, appears to be nearing the end of his time with United after he rejected the club’s latest offer of a short extension to his existing deal. 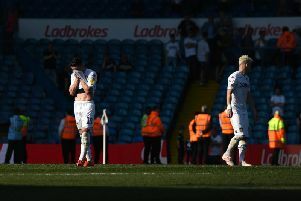 Leeds, who angered Byram’s camp 12 months ago by asking him to take a cut to his £12,000-a-week salary, went back to him last week with a proposal which would have matched his current wage and tied him down to the summer of 2017. The right-back remains on a deal to the end of this season and United are not expected to return to him with a further offer. Evans actively involved himself in efforts to instigate fresh talks following a bitter fall-out between Byram’s agent and club owner Massimo Cellino last year but he wants Leeds to invite bids for Byram next month unless the youngster alters his stance. Even if Byram opts to see out his contract and leave next summer, United would be entitled to compensation for their former player-of-the year on account of his age. “I don’t know if it’s dead,” Evans said. “I want Sam to have a week or two where we’re not discussing (his future) on a daily basis – where Sam gets the time to think really hard about whether he wants to leave this club. “I’ll make it clear when we get to January that if he doesn’t want to commit his future, I don’t want him around. We want players who want to be here. He’s not going to sit around and be a bit-part player. He’s got too much in the locker for that. Byram was included in Evans’ squad for Saturday’s win over Hull City and appeared as a late substitute. He was roundly applauded by the crowd and United’s head coach insisted that he would continue to involve the defender in the run-up to the turn of the year. Everton and Sunderland are believed to be interested in Byram but Evans said: “This club has demonstrated clearly that they want him to be part of the future. “I think the contract offer is a more than fair one. Byram has played more than 130 times for United since stepping up from their academy in 2012 and he is the leading appearance-maker in the squad at Elland Road. Evans remains intent on making substantial changes to his squad next month and admitted a 2-1 win over Hull had helped to by him time and patience after back-to-back defeats to Rotherham United and Queens Park Rangers.